It’s only by chance that nobody was hurt. Absolutely stunning aerial imagery from Network Rail, via The Landslide Blog. Over the last week, an incident of major proportions has occurred in the UK, at Hatfield, near Doncaster. It has gone largely under reported in the media, which is a scandal. This is a significant and worrying event, and is of interest to anyone interested in mining, industrial waste, spoil heaps, physical geography and geology. 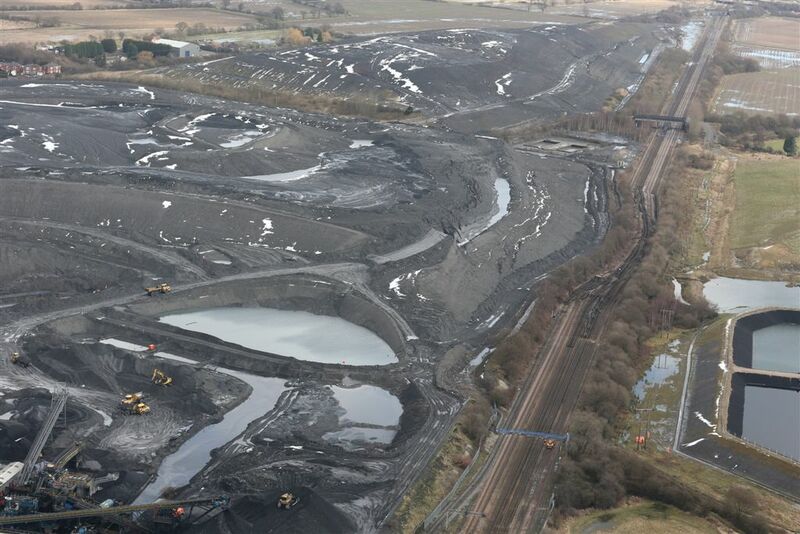 A landslip occurred from a mine spoil heap belonging to the Hatfield Stainforth Colliery, displacing the adjacent railway line in a remarkable manner. For those who are old enough to remember, there are echoes here of the terrible disaster of Aberfan in 1966, which killed 116 children and 28 adults when a colliery spoil heap, destabilised by heavy rainfall and being tipped haphazardly upon a natural watercourse, became fluid and washed down in the the tiny welsh village at it’s foot, with disastrous results. As a consequence of Aberfan, management and legislation relating to these sorts of sites in the UK has been extensive and thorough ever since. In recent years, the manpower in the agencies charged with inspections of such sites, and mines and quarry in general, has declined. This is a grave mistake. For anyone wanting to explore the issue, or find out about the nature and possible causes of the Hatfield landslip, theres some great work going on on the Landslide Blog by Professor Dave Petley of Durham University. Here, you’ll find pictures, good analysis and informed comment. Please check it out. Remember that in years gone by, Brownhills, Walsall Wood and the whole of our area was dotted with heaps like this, mostly gone now. The management of such mounds is not a simple matter. We owe it to public safety – and indeed, the lost of Aberfan – to continue to operate sites like this in a safe and professional manner. That means supplying the manpower, expertise and technology to analyse what went wrong and ensure it’s not allowed to happen again. Click on the screenshot to visit a remarkable blog. This entry was posted in Bad Science, Environment, Events, Fun stuff to see and do, Interesting photos, It makes me mad!, Local History, News, Shared media, Social Media, Spotted whilst browsing the web and tagged Aberfan, Accident, Blog, Brownhills, Brownhills local history, colliery, Dave Petley, Doncaster, Events, Geology, Geophysics, Hatfield, health and safety, Landslide, Landslip, Local History, mine, mining, mining inspectorate, New Photos, physical geography, pit, Railway, slag heap, Spoil heap, Stainforth, Things to do, Walsall Wood. Bookmark the permalink. This did get prime time coverage on BBC news. It was a relatively cursory mention. Note I said ‘under-reported’ and not ‘unreported’. As far as I’m concerned, this is a major industrial incident. But at the moment we’re obsessed with the papacy and dead horse.